It feels like we just hopped in the local Tyme Machine and are visiting the Kings of Cork website in 2010. Or this is Deja-vu seeing two consecutive articles featuring the name Suppan. So what’s all this Suppan talk about today? The Brewers just signed Kyle Lohse. At first glance, every Brewer fan is saying ‘Awesome, we need starting pitching… bad.’ After closer examination (and comparison), Brewer fan’s might be spelling Lohse ‘S-U-P-P-A-N’ by the end of the season. Suppan was signed by the Brewers in 2007 for 4 years at $42M. Lohse was signed today by the Brewers for 3 years at $33M. Suppan played for the Cardinals in 2006. Lohse played for the Cardinals in 2012. Suppan had a career 4.70 ERA. Lohse has a career 4.44 ERA. Suppan ended his Cardinal career with his two best seasons (4.12 and 3.57 ERA). 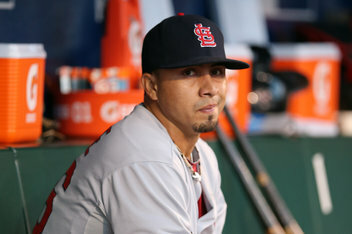 Lohse ended his Cardinal career with his two best seasons (3.39 and 2.86 ERA). Suppan had a 4.95 ERA for all his seasons as a Brewer. Suppan had a career 4.92 K/9IP. Lohse has a career 5.66 K/9IP. Suppan had a 5.16 K/9IP for the Cardinals. Lohse had a 5.63 K/9IP for the Cardinals. Suppan had a 4.66 K/9IP for all his seasons as a Brewer. Suppan had a career 1.19 HR/9IP. Lohse has a career 1.07 HR/9IP. Suppan had a 1.10 HR/9IP for the Cardinals. Lohse had a 0.87 HR/9IP for the Cardinals. Suppan had a 1.20 HR/9IP for all his seasons as a Brewer. Suppan had a career 10.06 H/9IP. Lohse has a career 9.75 H/9IP. Suppan had a 9.52 H/9IP for the Cardinals. Lohse had a 9.29 H/9IP for the Cardinals. Suppan had a 10.85 H/9IP for all his seasons as a Brewer. Just when my blood pressure was beginning to lower during the Brewers starting rotation (relief pitching is a different story), the Brewers organization signed another player whose name is spelled ‘S-U-P-P-A-N’ on the back of his jersey. History does appear to be repeating itself… just a little too soon for Brewer fans.